Do You Have The Right Car Seat For Your Child? Car seats are designed with a sole purpose in mind – keeping your child safe while traveling in an automobile. Not all car seats are equal. Some are designed for toddlers, while others work best for older children. Choosing the correct car seat for your child can make a huge difference in their safety out on the road. Two factors should be considered when selecting a car seat: age and size. You need a car seat that fits into your vehicle but, more importantly, fits your child. 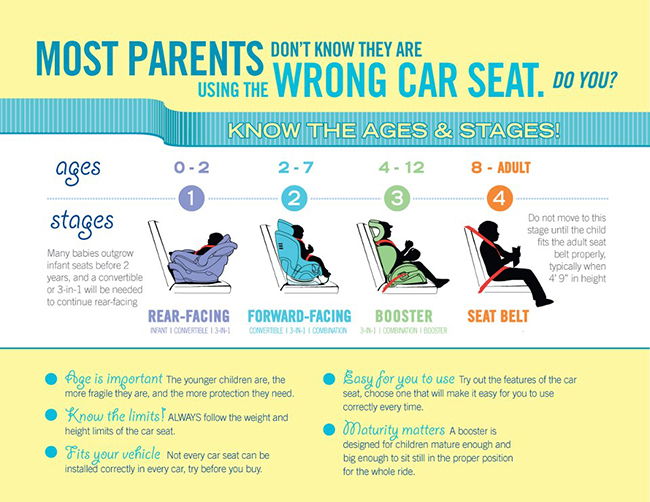 Check both height and weight requirements to make sure your car seat is right for your child. If your child fits within the specified height and weight parameters, keep them in the car seat for as much time as possible to enhance their safety. Purchasing a car seat that fits your child’s needs starts with knowing what a child needs at specific ages. What protects a toddler in an accident might not be enough protection for a baby. Rear facing seats are the best for keeping a young child safe. It is equipped with a harness. During a crash, the harness moves with your child and cradles them to limit the amount of stress on their neck and spinal cord. Forward facing seats are equipped with a harness and tether. These work together to limit your child’s forward movement upon impact. Booster seats are designed to position a seat belt so it fits properly over your child’s stronger body parts and offer them maximum protection. These are best for young children who have outgrown the toddler stage. Seat belts are restraints designed go across the upper thighs and down from the shoulder across the chest. They reduce forward momentum and are designed for older children who no longer need a booster seat. A seat belt should never rest on the stomach or neck because it can injure those areas in a crash. Which car seat is appropriate for your child? Children 12 months or younger should always ride in a rear facing seat. When your child is between 1 and 3 years, they should continue to ride in a rear-facing seat as long as they do not exceed the height or weight limit. When they grow too big for a rear-facing seat, they can be moved to a forward facing seat. Children from 4 to 7 years should ride in a forward facing seat until they reach the manufacturer’s height and weight limit. They can then move to a booster seat. Only between ages 8 to 12 are children large enough to graduate from booster seat to seat belt.